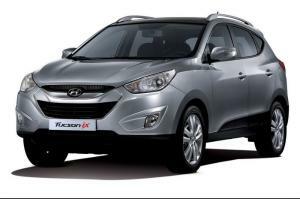 This older model of Hyundai Tucson 4WD has a 3.0L V6 gasoline engine. The jeep is suited for driving around Iceland and also in the Highlands (F-roads). No fee for additional drivers and you can drive unlimited mileage! Model 2008-2010. 5 Passengers, 5 Doors, Automatic, CD Player, Airbags. Suitable for F-roads. Unlimited mileage. 3,0L V6 gasoline engine, 9,7 L/100km, all-wheel drive. All insurances and taxes are included in our prices!